As the hazy, orange sun sets over these lazy summer evenings and the insects clumsily fly through the shimmering evening heat, the scents and flavours that I want to immerse myself in are those of the Eastern Mediterranean. However, it’s not just the food that I’m after, even though that would be no great loss (!) but the whole culinary, cultural approach. No procession of courses, eating with your hands; food to get stuck into. I envisage a multitude of different delicious dishes along a table that encourages conversation, sharing, food passed around and the tearing of bread. To me, this can only mean one thing – mezze. At home, creating a mezze spread of eight to ten dishes is unrealistic, but creating individual pieces of a mezze every now and again can be fun. Traditional mezze dishes include: fattoush (bread and vegetable salad), hummus (chickpea dip), falafel (deep-fried chickpea balls), köfte (minced lamb meatballs), mutabbal (aubergine salad), souvlaki (lamb kebabs), tabbouleh (bulgar wheat salad) and olives. There are several more dishes that can be seen on a mezze table with each region of the Mediterranean creating alternatives and variations. And with BBQ season in full swing why not try to create your version of a classic mutabbal? Whether you know it as mutabbal, aubergine salad, poor man’s caviar or baba ganoush, this smoky aubergine dip is the grown up version of the ubiquitous hummus and is a classic part of any mezze. Levantine in origin, it comes up under a variety of names from Turkey to Egypt and can be presented in different guises: a dip, a salad, a vegetable side dish. It can be served loose and smooth to be scooped up by your flatbread or served chunky needing a fork to assist but no matter which variation you choose it will still be exceptionally good. The only strict rule that I insist you adhere to is that the aubergines must be blackened on open flame – too many versions fail to recognise the importance of this. It is this process which gives this dish its distinctive, smoky taste. Cooking them in a smoking hot oven will not give you the depth of flavour you require here – a grill set to max would work but it will smoke out the entire house. Those who have gas hobs can blacken the skins on the actual hob but this will make a mess! Basically, a BBQ is the most effective and convenient method to achieve aubergines as desired. Understandably, this is not the best dish to try to recreate in winter! My method borrows from both, I tend to cut into the aubergine creating a few incisions (face up) along the length of the vegetable, drizzle oil over and place into the hottest oven for 20mins and then grill on open flame until scorched and black. Remove the scorched aubergine from the flames and then scoop all the flesh and juices into a blender (or bowl and use a fork). Add the juice of half a lemon, one table spoon of tahini paste, a garlic clove per aubergine and a good drizzle of olive oil to slacken the mixture. Season to taste. Add chopped fresh mint and coriander. Taste your baba ganoush and tweak the flavours to suit your palate. Some recipes include tomatoes, after all it is sometimes referred to as an aubergine salad with tomatoes or a tomato salad with aubergine depending on which side of the Mediterranean you come from, but I find this just dilutes the intense smoky flavour that you want from your Baba Ganoush. Drizzle olive oil in a dark green ribbon around the dish and if you’re in an extravagant mood rain over pomegranate seeds for that jewel-like touch of decadence that inspired this dish. NB: You lit up your BBQ to cook something other than aubergines on it! 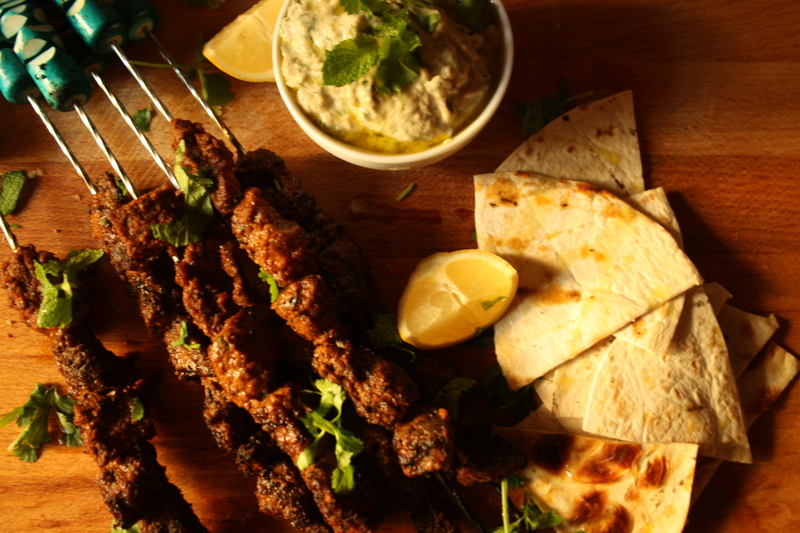 Pinchitos (our beef versions of lamb souvlaki kebabs) is a perfect accompaniment to baba ganoush; serve with some BBQ-warmed pita/tortillas/flatbreads/naan bread and fresh coriander and mint sprinkled over. Even though the first day of summer is officially 21st June, here in Gibraltar, dusting off the grill and serving up a platter of barbequed delights anytime between April/May is a good indication that summer is on its way. The question is always: who is going to be brave enough to be the first to strike up the BBQ? Waking up from our winter/spring hibernation-state brought on by the dark, cold and rainy season. The extended hours of daylight means we leave the comforts of the home and spend more time outdoors. We start to alter our eating habits: food becomes lighter and fresher during the day and we tend to eat later in the evening. As the weather gets progressively warmer we move out of the house to cook on open flame; all strategies designed to help combat the summer heat. Cooking on open flame can only mean one thing – barbeque. And nothing beats the taste of BBQ! Succulent meats flame-licked to tender perfection, grilled veggies scorched into savoury crispness, flaking off the bone ribs and sumptuous seafood designed to be cooked over charcoal. 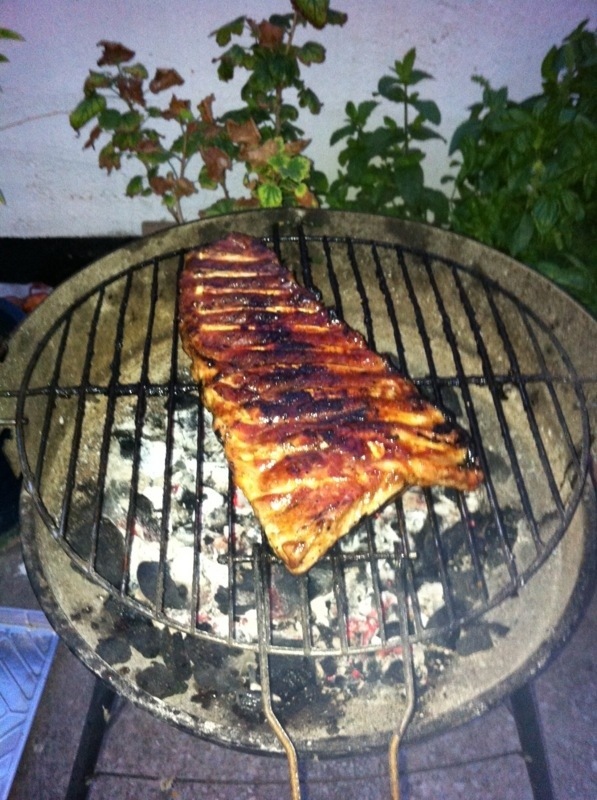 The joy of BBQ food is that you can make it as cheap or extravagant as you want; you can cater for one or one hundred. Children tend to gravitate towards the quintessential BBQ staples: sausages, burgers and corn on the cob. Those of more diverse palate can taste grilled seafood, choice cuts of meat and even ask for these to be cooked to their liking. But as delicious as BBQ food is, the main reason why we love a good BBQ is the social aspect of the event. These get-togethers are intimate, laid back affairs. There is no procession of courses – the way the food is eaten and served is informal. People will generally dispense with cutlery, eat standing up whilst mingling, locating drinks or foraging for food. There is no meal time constraint; food comes as and when it is ready – meats are not cooked at the same time to provide a self service style buffet; service is relaxed and dependent on whether your guests could have, “another little bite!” This can sometimes go on for several hours should the conditions be right. BBQ role-reversal etiquette dictates that the man of the household does the cooking. Mum probably cooks all year round, slaving in the kitchen, to provide food for her family but come BBQ season, cooking becomes man’s domain. Subsequently any of the male guests will congregate around the fire and make noises of approval/disapproval as to how well food is being cooked. Ultimately, BBQ’s are very convenient. 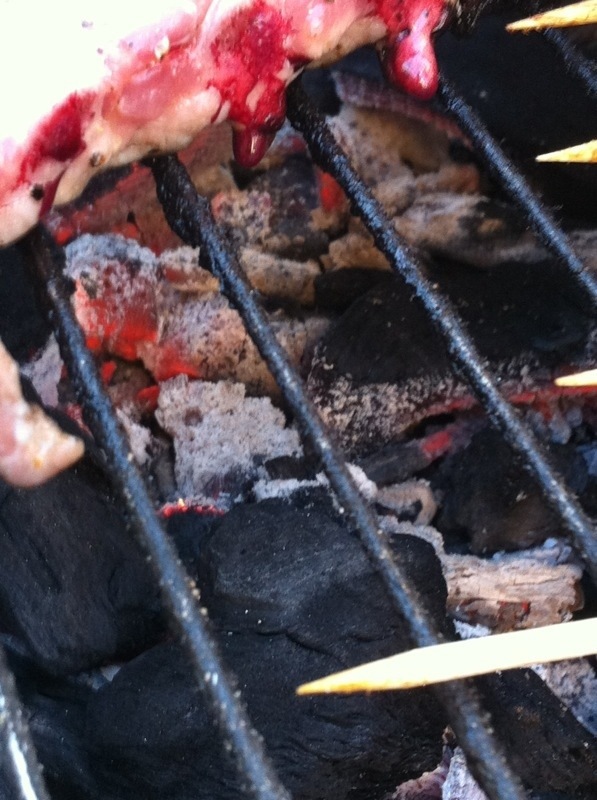 We can use disposable BBQ sets, self igniting charcoal bags as well as disposable cups, cutlery and plates. Creating minimal washing up after the event. BBQ’s are usually celebrated with close friends and family and have the same cathartic effect on us as other major celebrations. Everyone feels good at BBQ’s. So whether you do it in your patios, gardens, balconies or at the beach (getting appropriate permissions) light a fire, skewer some meat or seafood, rinse out your beach towels and get grilling. Let’s enjoy the summer. The Neanderthal in me; challenged as I strategically pile the charcoal around the fire lighters, comforted as I watch the sunset-red flames dance around the coals, rapturous as I fan the fire to make sure the black coals are turning white. BBQ season is upon us. And in my household (i.e. me!) it means being as adventurous grilling as it does cooking in my kitchen. Yes, grilling. Not barbecuing. 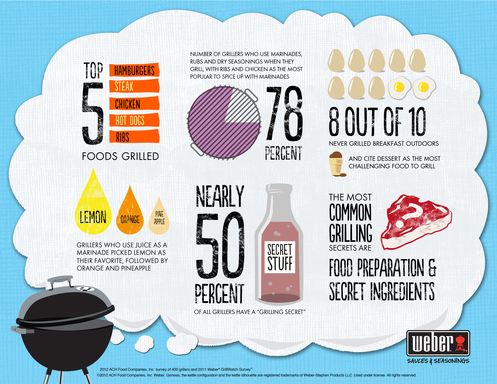 In much of the English-speaking world, “barbecuing” and “grilling” are used interchangeably. However, in USA’s South “barbecue” describes a cooking method in which food is cooked slowly over the indirect heat and smoke from a charcoal or hardwood fire. The food is never placed over the hot coals hence closing the lid helps to create an oven-like environment to retain the heat. Whether you have a large family-sized terrace, garden or 2m x 1m balcony, cooking over a live fire is neither a weekend ritual nor a professional technique. Everyone can do it. And in Gibraltar, during the Summer months, everyone does. As you walk around the different housing estates, you can smell the characteristic chemical smell produced by firelighters or alternatives and burning charcoal. But if you’re really lucky you also get to smell the delicious offerings the grilled meats and fish fill the stifling, summer evening air with. 1st: Once the flames have died down on the barbecue, place a saucepan onto the grill and add butter, maple syrup and dark muscovado sugar. Mix together. 2nd: Rub olive oil, salt and pepper onto the rack of ribs and place onto the grill. If your bbq set has a lid on it then you can choose to “barbecue” it. Make sure to place the ribs on the coal-free area as you are cooking indirectly. 3rd: Regularly baste the rack with the maple syrup glaze. 4th: Once the ribs are cooked, it is always a good idea to split the individual ribs to give it one final basting on all sides. Having the right tools will undoubtedly make the task easier. A pair of heavy-duty, long-handled, spring-loaded tongs are the undisputed number one grill tool. Like an extra hand that doesn’t get burned, they are ideal for placing food on the grill, moving it around whilst it’s cooking, picking it up to check for doneness, and taking it off the grill. Don’t buy those cheap supermarket barbecue kits with tongs & spatula as they are both disastrous to use! Convenience is the order of the day, especially if there are guests. Use disposable skewers for pinchitos and kebabs and disposable foil trays. Foil trays have many uses other than being disposable. Whilst grilling, they are ideal for covering thick cuts of meat or bone-in chicken that’s not quite done but that you don’t want to burn to a crisp. Without the use of a lid you can create a mini-oven. Next to tongs, your favourite beverage, may be the most indispensable grilling tool. It helps keep you calm and collected while you’re tending the fire – a key to success. So why not relish in the near-mythic social ritual that is the barbecue and stand, like Homer Simpson, with tongs in one hand and beer in the other. Do it alone, invite people round, keep it cheap or go crazy at the supermarket – either way light the fire, open a beer and grill away… come on…unleash your inner caveman!